Why Is This Man Wearing His Trash? 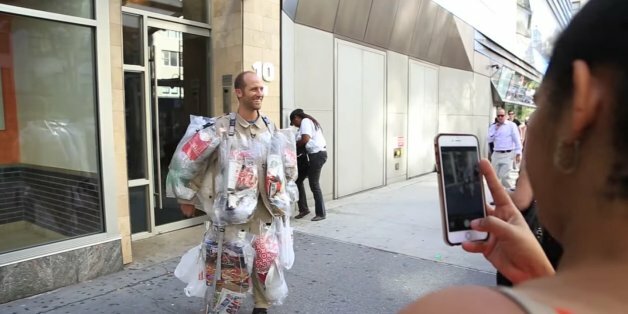 His commitment to wearing the specially made trash suit for a month may seem like a gag, but Rob's goal is to make us more conscious about the trash we create and what we can do to help. When it comes to my boy's -- and my patients' -- health, I always take the better safe than sorry approach. Exposure to toxins in foods, cleaning products or other areas can have long-term effects on the developing child. I think we can all agree that goats are a little weird. Or at least, seemingly. They are, perhaps, not unlike the elusive durian--much-maligned for being thorny and smelly. But just as the durian's facade gives way to delectably sweet fruit, so too does a goat's. As defined by the United States Environmental Agency, "Sustainability is based on a simple principle: Everything that we need for our survival and well-being depends, either directly or indirectly, on our natural environment. You Can Help Save The Planet. Here's How. A few weeks ago the crew and I from Behind the Brand made a road trip from LA and headed up North just past San Francisco to the little town of Petaluma in Sonoma County to visit the team from CamelBak. Are you one of those super environmental types who shops at Whole Foods and your local farmer's market, avoids GMOs, and does your housekeeping only with eco-friendly soaps and detergents? But then when it comes to fashion, suddenly all their rules about purchasing products that are good for the earth fly away. It recently struck me that the marriage of ethics and aesthetics in the premium segment of consumer goods seems to be considered a luxury too extravagant to indulge in by the fashion industry. While they are happy to send their children off to school each morning, they worry that the busyness of the school season will make it difficult to keep things organized, clean and green. Fortunately, I have some tips for how parents can not only start the school year off green and organized, but keep things moving along nicely as the year progresses. There are very serious issues affecting animals and the environment. My jungle characters began to speak up, and who was I to stand in their way? Two years ago I found out I had an aggressive form of breast cancer. After going through such a sudden, unexpected, terrifying experience, I've begun to question everything. I've developed serious paranoia about the world around me and all of the chemicals we live with. "It is not just about a pretty dress," says Amis Cameron. "Because we all wear clothes every day, it is important to start thinking about how they are dyed and milled and what that is doing to our planet and our bodies in the name of fashion. You don't have to wear a dress made out of oats or offer a cake made out of raw sprouts.